I feel like a naughty child today. I signed up for my first ever Daring Cooks challenge and what did I go and do? Miss the deadline! I somehow got the dates mixed up or something. I intended to make it on Saturday (but then never got round to it - we went shopping instead! ), but for some reason didn't realise that the reason I had it earmarked for Saturday was because the due date was Saturday. Oy vey. Back to the tandoori though - it was exactly the way I wanted it to be. Succulently spicy chicken threaded onto a kebab and served with some raita on the side - it's hard to imagine a more casually delicious supper. 1. Cut chicken into bitesize chunks and set aside. 2. Finely grind the cumin, coriander, cardamom, cloves & bayleaf in a pestle & mortar (or cheat like I do and use a coffee bean grinder - works like a charm). The bayleaf won't grind to a powder, that's okay. Mix with the rest of the spices, lemon juice and yoghurt. 3. Work the marinade into the chicken using your hands, ensuring all pieces are fully coated. Cover with clingfilm and allow to marinade for 30 - 40 minutes in the fridge. 4. Thread the chicken pieces onto kebab skewers and grill in the oven at 200C until done. Be careful to not overcook them, they will still be tasty, but a little bit too dry. I found 15 minutes did the trick. Serve with tomato wedges and a cucumber raita. I love the look of those, am definitely going to give them a try. 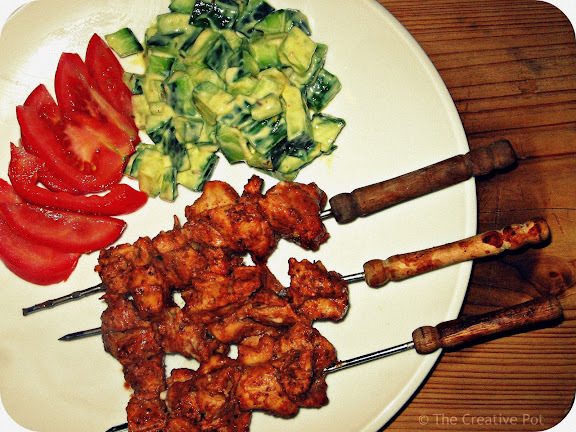 Oh yummee, this looks yummee and spicy and with the cooling cucumber salad, it looks like a real exotic treat!!! gotta love tandoori. yours looks good. Tandoori chicken is soooo one of my favourites - and the good thing about making your own is that you know there are no weird food colourings and things in the mix...! Yum. I love tandoori chicken, this looks really great, will have to try it! These were great for Taste and Create. I now have a new chicken recipe!!!! Thanks for being my partner. They were great!